Lewes Castle and adjacent Barbican House Museum are now open to the public again. There was a Saxon castle here in very early times, on the site of which William de Warenne and his wife Gundred, the daughter of Duke William, reared a Norman castle, which continued in the hands of that family until their extinction in the fourteenth century, when Lewes became the property of the FitzAlans of Arundel. Isabella, the sole heiress in the fourth generation, carried the earldom in marriage, first to William de Blois, a son of King Stephen, and after his death to Hameline Plantagenet, a brother of Henry ll., and these great lords de Warenne continued here until the last of them died in the reign of Edward III. The most stirring scenes in this castle’s life occurred during the Baron’s War in 1265, at the battle of Lewes, before the erection of the great Edwardian gatehouse and walls which we see at the present time. The situation of Lewes Castle on the summit of a steep hill, up and around which the town clusters, is a most commanding one, having wide views over the Downs on the E. and W., with an even more extended prospect to the N., and over what is now the fertile meadow land in the S. towards Newhaven, but what then was an arm of the sea covering at high water an immense expanse of muddy waste. A better position for defence and protection could not have been selected, and its former importance is thereby strongly indicated. The castle was quite irregular in its trace, suiting the contours of the hill top, and enclosing within the walls an area of about 31 acres. These were defended on the N. E. and S. sides by a ditch, while on the W. a very steep escarpment sloped down to the lands below. Within, the builders found two large mounds, the foundations doubtless of ancient houses, on the N.E. and S.W., and on these they erected two keeps, 800 feet ,apart, being the only instance of double keeps known. On the former, called the Bray or Breck Mount, was the chief tower or donjon, formed of a cluster of octagonal towers set round a centre one, on a plan similar to that of the keeps of Coningsburgh and Castle Acre,both of which castles belonged to the first Earl Warren, as well as Lewes. This tower is 75 feet in diameter, and at a later period two octagonal towers were added, having three storeys each, which remain, and have of late years been made habitable. Traces only exist of the second keep in some heaps of masonry, and little more than half the external walls may now be seen, but no vestiges remain of the buildings contained in the base court. 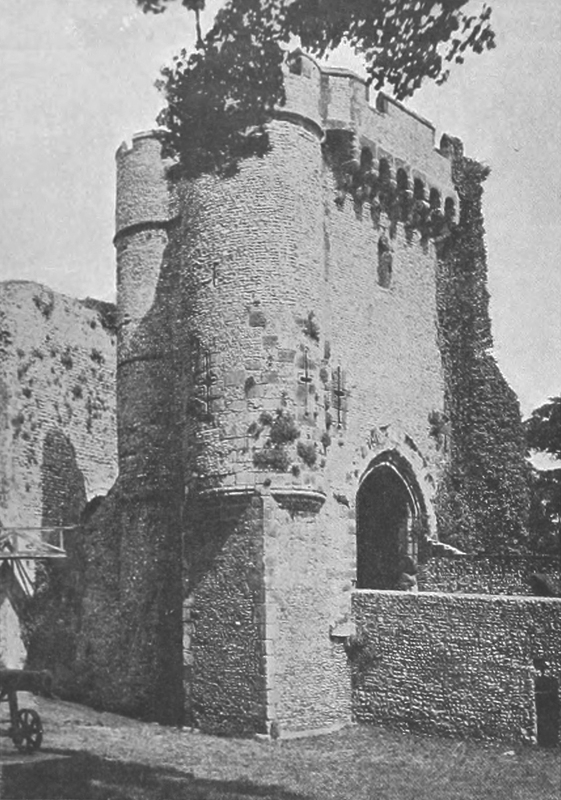 In front of the old Norman entrance, in the S. wall of the castle, stands the barbican or outer gateway, a square tower flanked with two circular angle towers, having a spiral stair in the N.W. corner, and armed with machicoulis ancl battlements that have been partly renewed ; there were two portcullises and a drawbridge here. The date of these buildings is about the middle of the thirteenth century.